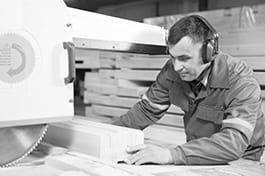 Wood processing plant operators set up, operate or tend woodworking machines, such as drill presses, lathes, shapers, routers, sanders, planers and wood nailing machines. Study work orders to determine requirements. Determine product specifications, materials, work methods and machine setup. Feed stock, e.g. through feed mechanisms or conveyors. Monitor operation of machines and make adjustments. Detect rot, splits and other defects in wood and finished products. Check quality, packaging and stacking of products. Adjust, clean, repair and replace machine parts. Record production details and report machine or production faults.